﻿ Banyan Tree SPA Sanctuary, Phuket | FROM $473 - SAVE ON AGODA! Have a question for Banyan Tree SPA Sanctuary? "Awesome experience, all you can spa!" "Very attentive, kind and helpful staff!" "Convenient location with options to local food, supermarket, local Friday night market!" "Unlimited massage in thevilla is the biggest draw ! And the..."
Enjoy a five-star getaway with your family and spend your time away being pampered at the Banyan Tree SPA Sanctuary. This property is close to Banyan Tree Golf Club, Laguna Phuket Golf Club, Canal Village Shopping Centre, Bang Tao Beach, and Milan Tailor Ltd. The rooms at this property have lagoon and pool views for guests to choose from, so you are bound to be peering out at unforgettable scenery. From dry cleaning services to daily housekeeping, the property offers useful services for guests to take advantage of during their stay. It features a kids club, offering parents a fun and entertaining childcare resource. 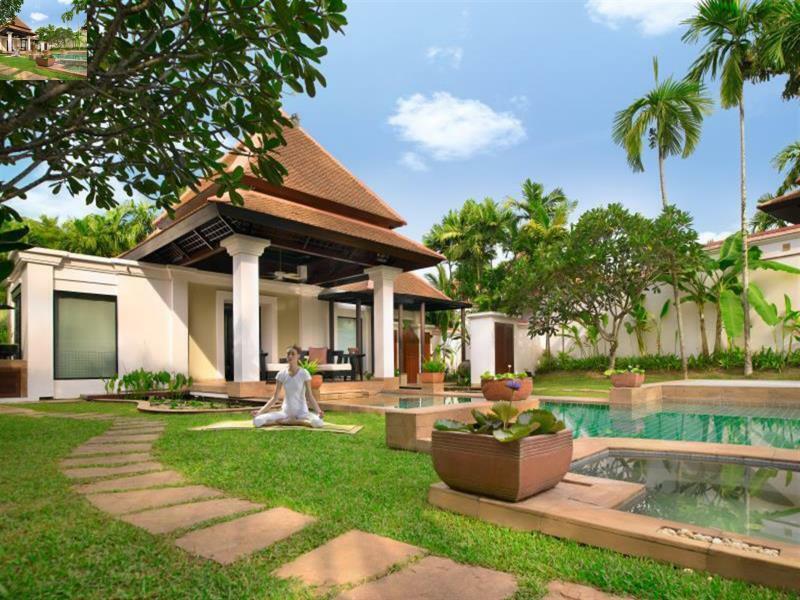 Featuring a golf course, a fitness center, a tennis court, a garden, and a sauna, the Banyan Tree SPA Sanctuary is fully equipped to make sure that your time away will be as comfortable as possible. The property has air conditioning, an in-room safe box, slippers, and an ipod docking station. It also has bathrobes, a closet, towels, a coffee or tea maker, and other amenities. With Thai and Asian restaurants nearby, you can choose your favorite cuisine. 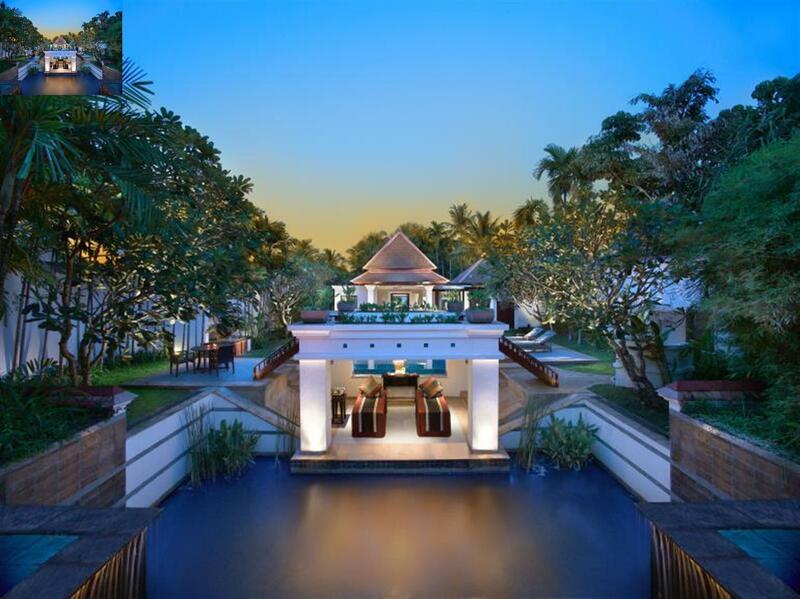 From a bar to a poolside bar, the Banyan Tree SPA Sanctuary has a range of dining and snacking options. There's free Wi-Fi available in all rooms, as well as Wi-Fi in common areas, ensuring that guests are able to contact their friends and family without splashing out on international charges. The Banyan Tree SPA Sanctuary has numerous convenient features, such as safety deposit boxes, a currency exchange, an infirmary, and a salon. English, French, Russian, Cantonese, German, and additional languages are spoken at this location. 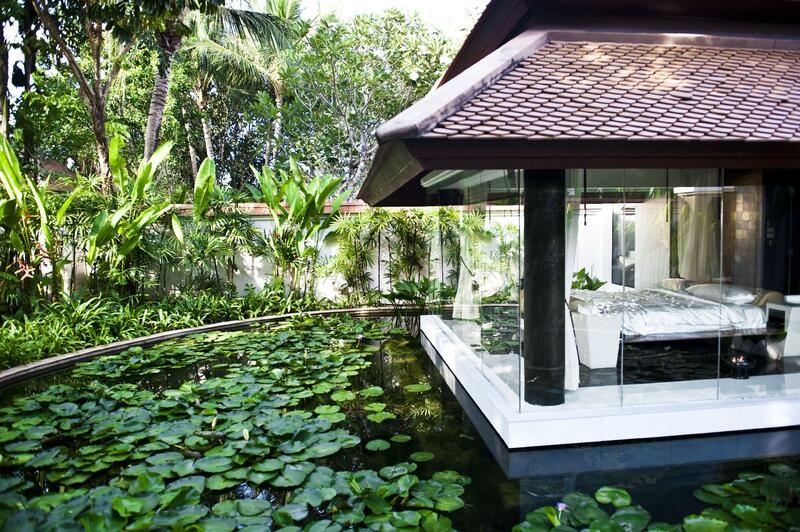 The Banyan Tree SPA Sanctuary provides elevator access and is wheelchair friendly. The property allows pets, saving you the trouble of finding someone to look after your pet while you're on holiday. If you want to spend the day simply relaxing and unwinding, visit the nearby massage facilities. With guided tours available, this property is a great place to stay to learn about the area and see everything you can while you're here. It offers horseback riding, so you can see Bang Thao from the saddle of a horse. Non-motorized water sports are available in the area, enabling you to enjoy the day out on the water. Phuket Bus Terminal 2 is 15.3 km away. The nearest airports are Phuket International Airport (HKT) and Krabi International Airport (KBV), which are situated 10.7 km and 75.9 km away. "This resort is just a PERFECT retreat holiday." Guests can choose from 50 different wellness activities which are included in the room rate. For more details, please contact the property directly. Various parts of the property will be undergoing renovation from July 1, 2018 to October 31, 2019 (excluding December 23, 2018 to January 9, 2019). There will be some areas affected by the noise from 09:00 AM to 06:00 PM. For further queries, please contact the property directly. From the moment we walked through the doors of the Banyan Tree Spa Sanctuary all our cares melted away. The staff are amazing. So helpful and friendly. They anticipated our every need before us and ensured our stay was super relaxing. The therapists we encountered were definitely some of the best trained i have ever encountered. Afternoon tea served daily in your own pool villa overlooking the lagoon and buggies to drive you anywhere you want to go throughout the resort. Cant recommend highly enough. Awesome experience, all you can spa! Very attentive, kind and helpful staff! Convenient location with options to local food, supermarket, local Friday night market! 2 ~ 5 July 2016 marked one of the best experiences I have had for a long time. As a frequent traveller to exotic locations and accommodations, Banyan Tree Spa Sanctuary is indeed a league of its own. One of the most valuable assets Banyan Tree is their staffs. The reception manager, therapists, room cleaning staffs, buggy drivers, and even general cleaners we meet within the vicinity of the villa, they never fail to smile and greet us. The warm gestures made my partner and I feel especially welcomed. I remember feeling under the weather on the second day of my trip that I had to visit the clinic. Upon returning to my villa, I was pleasantly surprised to receive a beautiful bouquet of flowers and got a well message from the staff members. All the staffs seemed to know that I have been feeling unwell and they will always send their warm regards whenever they see me. Such kind gestures have brought warmth to my heart. The accommodation is absolutely beautiful. We were indulging in the opulence of the villa with the gorgeous lagoon views. The place is well maintained with a touch of Balinese style we absolutely fond of. The turning down service was such a delight. Every night we were treated (with a surprise) with special elements. On the first night, our bedroom was lit with candle lights and a bottle of chilled champagne at out bedside. The second night were were introduced the romantic honey rub in the steam room. On the third night, we were treated with aromatic rose tea and dried mango. It's precisely these special and thoughtful gestures that truly set Banyan Tree worlds apart of its competitions. Banyan Tree Spa Sanctuary does not allow children below the age of 18 so it's perfect for couples who are looking to pamper themselves and romantic getaway. Already the third year coming back here, seriously thinking if I still want to go back next year. The mosquitoes seems less than last time I've been here (less, not none). The hotel is really quite old/worn out and can do with A LOT of touch up. During our stay, the TV and the fan broke, the shower room smells like 5 sweaty men working out inside the shower room for 3 hours. The pool is really dirty (and I was stupid enough not to call someone to clean it up). (the pond is quite dirty) The house keeping keep forget "something" every day, refill the mini bar, the foam bath, the matches (but gave us 3 incense to burn), forgot to refill amenities. They will agree a time with you on the daily massage and housekeeping and turn down service. I'm those kind of person whom, if you don't agree a time with me, I'm fine. But if you agree a time with me, you have to stick with the time; which they failed to do so on the first day. We asked for a 10am massage, and we wait for them. Till 10:40 still no one came. I called and then they told me they can't do it at 10am and can we change to 11. I would expect you to call me when you knew you can't make it at 10, not told us ONLY when we called. (same thing happened to the turndown service, we waited, no one came, we called and THEN they tell us the time we choose they cannot make it) It definitely is not a bad hotel, but with that price range, I (maybe greedy) would expect a higher standard. Great spa, nice gourmet, good stay. Fantastic. Definitely will come again. Quiet Surroundings. Extremely Large Private Space. Very Attentive and Responsive Staff. The trip was a quick 2 night getaway as taking a longer leave from office was a challenge. First the positives. The villa is huge and the private pool is the largest of all I have seen so far. View is also nice if u get a lake,facing villa. Definitely value for money when compared to other villa,style resorts (free 1,hr massage for 2 pax included in the package). The hotel staff are also very attentive and responsive while the spa therapist are amongst the best I have experienced. Now the negatives. The property is very well maintained but shows signs of aging. A few items (and really only a few) were a little too worn for my liking eg. cushions on outdoor sofa. Secondly, the beach is covered with debris and driftwood (applies to the whole coast rather than the hotel alone). Lastly, there are quite frequent ferries on the lake, allowing them to intrude on your privacy a bit. Overall though the positives far outweigh the negatives and the stay was a very pleasant one. 하루 한번의 마사지로 피로를 풀며 웰니스 프로그램을 즐기고 수영을 하게되면 정말 완벽한 하루가 시작되고 끝납니다! 무조건 이용해보세요 정말 만족 스러우실겁니다!